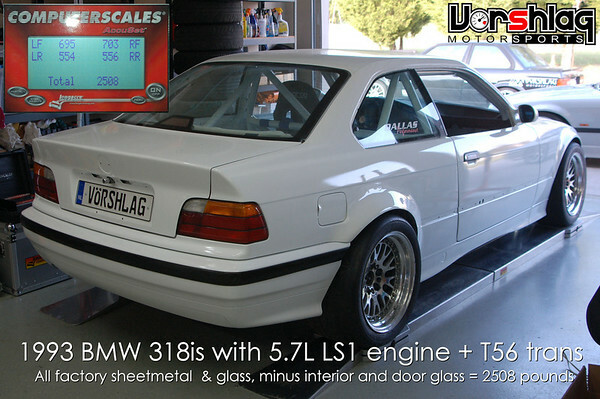 Pictures of the original "Alpha" Vorshlag BMW E36 LS1 project car. This 1993 BMW 318is was Vorshlag's main "shop race car" from 2006-2009. After a three seasons of autocrossing, track events and Time Trials, the motor was upgraded in late 2008 to a 7.0L that made 488 whp. The new engine was mated to a new Tremec T56 Magnum 6-spd transmission. The car weighed 2508 lbs and was sold in late 2009 to make room for more project cars at the Vorshlag garage.